At this point in writing my Numenera campaign The Paranoid Automaton, I’m beginning to add more detail to the middle portion of the campaign, which was the segment of the campaign that I initially had the most trouble with. When I play tested a rough draft of the game, the PCs weren’t close to coming to the center piece of Automaton, even though the session ran about three hours. A lot of it was due to something I had introduced in the beginning to which the players had unexpectedly wanted to investigate which I happily went along with. Another is my need to fully immerse the players in the Ninth World from unique descriptions of the locales to the different enemies/NPCs they met. Now I’m working at a point which the PCs didn’t get to which is the main location (I’m being extremely vague as not spoil anything, but will have a spoiler post soon enough) and initially I had a bit of writer’s block. 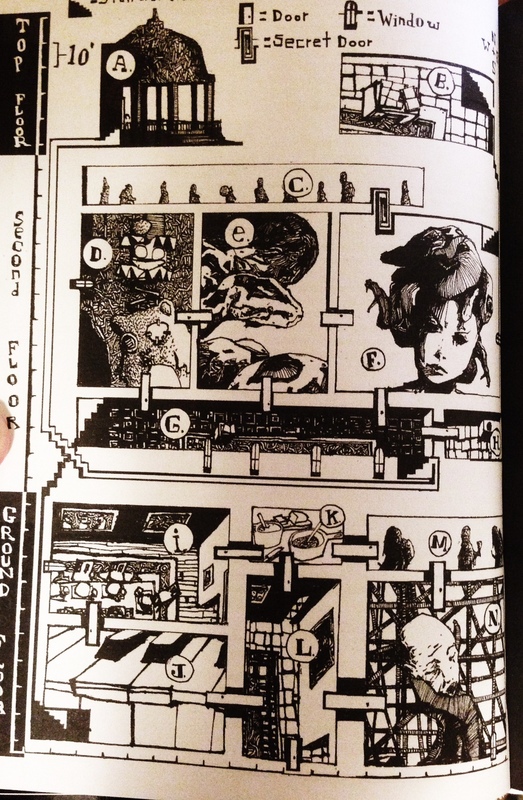 What I really didn’t want to happen was a straightforward dungeon crawl design, and for a few days I was stuck. I wanted to design an environment beyond what players might expect from the usual exploration dungeon crawl. 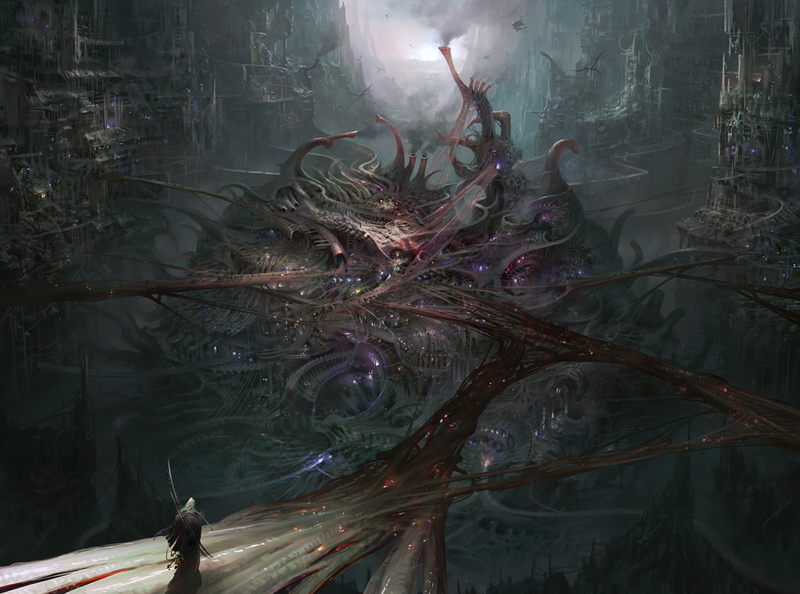 One of the very first things that got me thinking about how to construct something totally different than what I had done before with my fantasy games, were pictures and videos for the upcoming computer RPG game Torment: Tides of Numenera. To be honest, I don’t really know much about it other than it’s based on Numenera’s setting and it’s coming out in the first quarter of 2015. I didn’t need much to inspire me after seeing these gorgeous pictures and videos below. 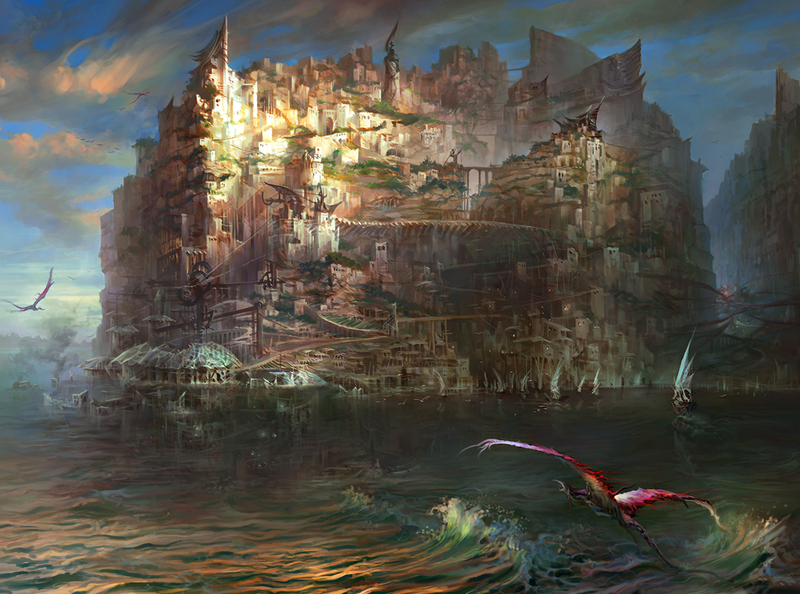 Having said that, I fully intend to get the Tides of Numenera. The game looks terrific. 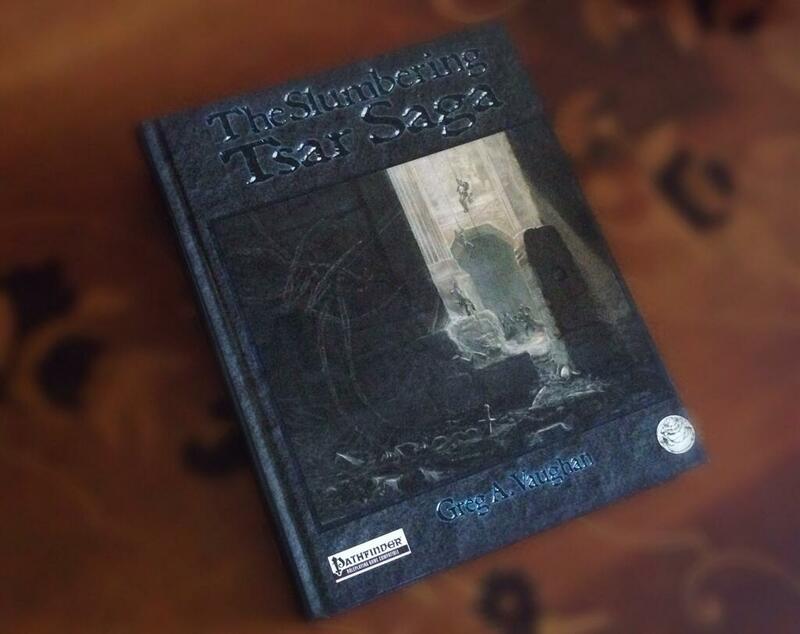 The Slumbering Tsar by Greg A. Vaughan is one of the biggest, if not the biggest, RPG fantasy adventure books produced. It’s a hardcover that’s nearly 1,000 pages long and weighs more than five pounds. If that’s not enough for you, it’s packed full of great adventures and monsters centering on the exploration of a great temple of evil and its surrounding areas. There’s a lot of inventive encounter ideas and NPCs that Vaughan’s packed in that you could mine forever to fit your genre of games. Although it was made specifically with the Pathfinder RPG in mind, someone not familiar with that system would still enjoy reading through this big fat tome. One of the many elements that I liked about Tsar was the many choices/paths that’s given to the players and how much detail Vaughan went into describing not only the towns/dungeons/temples, but the background behind these places and its denizens. I’m not aspiring by any means to write anything close to the length of Tsar, but I am attempting to give as many options for the PCs to explore without losing focus of the main objective, and to vary the enemies/allies they encounter along the way. 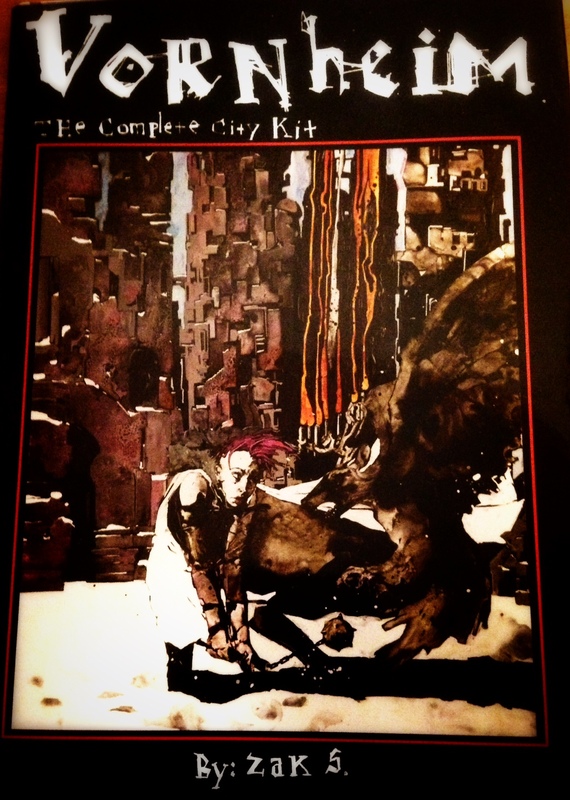 Vornheim: The Complete City Kit by Zak S.
And on the other end of the spectrum is Vornheim: The Complete City Kit by Zak S., a 64-page hardcover book detailing the city of Vornheim. It’s not as long, and doesn’t approach the epic magnitude of The Slumbering Tsar’s narrative scope, but Vornheim is definitely weirder and has a really fun and unconventional way of presenting some RPG elements, especially when it comes to its maps. House of the Medusa map featured in Vornheim: The Complete City Kit by Zak S.
Creatures that PCs could encounter in the city include a dividing demon, the beautiful but deadly Thornchildren and the very unusual creatures in Vornheim’s zoo. The many roll tables Zak S. has included near the end are one of my favorite parts of the book. In one roll PCs could find themselves in the middle of a lunar eclipse which does strange things to the citizens of the city, and in another roll encounter a cleric whose doubts in his religion could turn into a “horrifying” encounter for the players.